More Of Him: Cross Stitch Poodle!! Our friend, Vickie, has been sharing her monthly poodle patterns and I have been wanting to stitch them so badly, but up until now, I have had no energy. However, yesterday, I suddenly felt better than I have in months and decided to start on the poodles! I had these cute bookmarks that have lace around the edge but they were cream color and I knew some of the poodles wouldn't show up too well so I got my Ritz dye out and dyed them a turquoise color. I'm sorry the lighting isn't too good so you can see the color accurately but I'll be doing more picture in the future and am hoping I can get a better picture of the color. 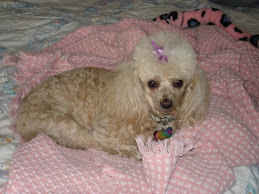 I started out by doing the April poodle because it looks just like my Mitzi! Again, the color doesn't look right because I was so anxious to share a picture with you, I took the picture at night. 😊 Anyway, here's a couple close-up pictures of the adorable poodle! It looks like I stitched a pink poodle, but no, it's white. lol Anyway, it's such a cute pattern and I can't wait to do more of the poodles down the bookmark. Many thanks to Vickie at A Stitcher's Story for creating these wonderful poodles for us! They make my heart so happy!! You can find all her poodle patterns on her blog under the Calendar Poodle SAL tab. Your little poodle bookmark made me smile. We had poodles growing up. My Mom had several white ones.